Every year on this day I listen to a long list of names being read aloud. I know only a very few ( as many, many New Yorkers do) and then only tangentially. So this day is not too personal to me - except how it is to every New Yorker and American. But every year on this day I am compelled to make my own list. A long list of names of those whom I would miss if they were gone. A list of people who have touched my soul (even tangentially or a long time ago) and for whom a smile of gratitude should be spent. I hope you too make time to honor those names -- those lives -- for whom you are grateful for in your own life. And not wait until it's just on a list or eulegy. In fact, why not call a few today? The 13th annual Town&Country Couture Design Awards is a major highlight of the Couture event. This year the voting system included an online first round of judging that let nearly 5000 people view and vote on the 168 applicants. WOW! Talk about viral marketing. After the first round online 80 designs were chosen to be displayed onsite at Couture. Show attendees made the final votes during the first 3 days of the show. Winners and finalists were announced at a fab party at Blush on Friday evening hosted by Jim Taylor, publisher of Town&Country. As Couture's consultant for the designer sector I was particularly pleased (read: out-of-my-mind happy) to see that many awardees were smaller, independant designers. This underscores that great design is born at Couture and belies any conspiracy theories. Finalists: Marco Bicego & Rodney Rayner Ltd.
Haute Couture Category Winner: Valente Gioiellieri S.P.A. Some of the winning jewels: tri-color "crushed" gold cross by Pamela Froman, black diamond ring by Erica Courtney, gold and moonstone ring by Betty Lou Moscot, blackened silver bracelet by Emily Armenta, colored diamond bracelet by Todd Reed and colored stone masterpiece by Sevan. This year, the Town&Country Couture Design Awards is tapping the power of the Internet to get the entire universe of jewelry lovers involved. 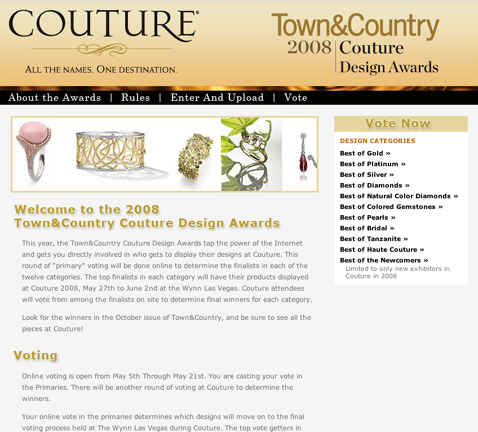 ANYone may vote at the www.Couturedesignawards.com website. Couture is the preiminent fine jewelry trade show that showcases only the best brands and designers in an exclusive environment. With online voting thousands more people can now experience the beauty of Couture. The internet voting determines the finalists in each of the twelve categories. Designers seen at Couture include David Yurman, Judith Ripka, Scott Kay, John Hardy, Gurhan, Erica Courtney, Coomi, Elizabeth Rand, Robert Lee Morris and 200 more stars of the fine jewelry world. The top finalists in each category will have their jewels displayed at Couture 2008. Couture attendees will vote from among the finalists on site to determine final winners for each category. Look for the winners in the October issue of Town&Country. Join me for some great brainstorming and networking at the MJSA Expo in NYC next Monday, April 14th... we're sure to come up with something that can make a difference for you in your business right now. Cindy Edelstein, Jeweler’s Resource Bureau; Chris Ploof, Chris Ploof Designs; Mark Shipman, Rio Grande; and Andrea Hill, Hill Management. Moderator: Rich Youmans, MJSA. Business knowledge can be less than riveting, but when it’s delivered in 60-second sound bites, you’ll find yourself truly engrossed! Business experts will give you power-packed, solid business advice you can apply and benefit from right away. This panel is sponsored by Clasp. 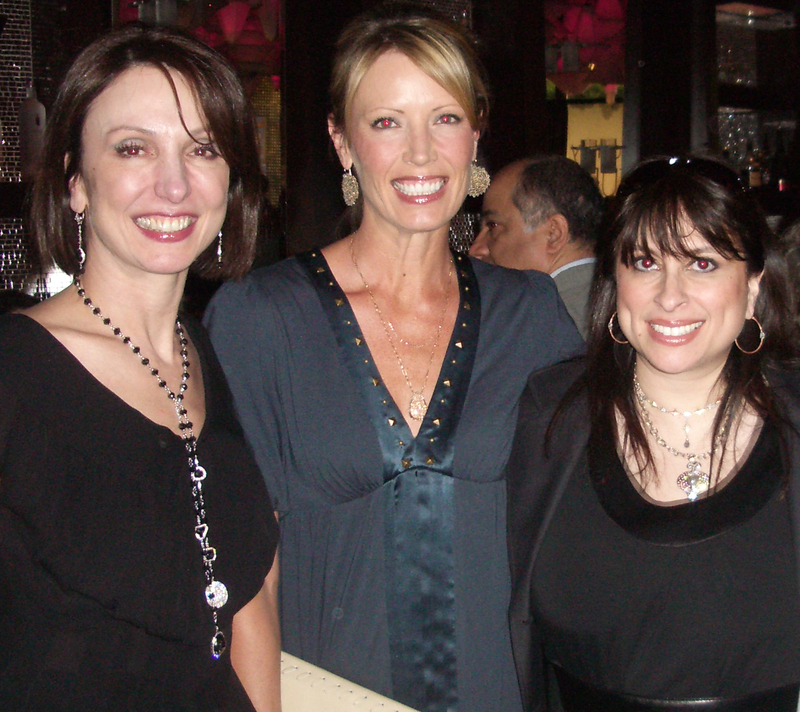 Marlene Richey, author, designer, and business expert; Cindy Edelstein, Jeweler’s Resource Bureau; Chris Ploof, Chris Ploof Designs; and a representative from Jeweler's Mutual Insurance Co. Learn how design can promote your bottom line from industry experts who will discuss web building, promotion, legal issues, and more. There's time in the middle of those two sessions for a coffee or two -- email me if you want to have a free 5-minute personal brainstorm session. Members of our jewelersresource.com JRB Network get the first shot at these opps but everyone's welcome! I'll be happy to book as many brainstorms as possible! See you next week at the Javits Convention Center in NYC. Learn more about Expo at the mjsa.org website. It has been just about a year (maybe 2) that we've heard mention of ethical jewelry MAKING practices and fair trade issues. We've always worried about ethical deals (think retailers switching stones, manufacturers underkarating, etc.) but ethical creation? A new concept that has just started to take hold as witnessed by the first-ever Ethical Jewelry Summit last month in Washington, DC. This event brought together a broad spectrum of industry leaders and Represented at the conference was World Bank, Ethical Metalmiths, JA, Cartier, ARM, Tiffany, DeBeers, CJRP, GIA, Rapaport, as well as major suppliers, such as The Bell Group and Hoover and Strong. Some of the retailers and manufacturers included: Leber Jewelers, Brilliant Earth, Toby Pomeroy, Lori Bonn, Cred Jewelers, Vukani-Ubuntu, and Columbia Gem House. Fair Labeling Organization, FLO international, represented by Transfair USA, was also in attendance. I personally know three leaders in this movement --- Martin Rappaport, Marc Choyt and Lori Bonn -- and their progress has been remarkable.